The GSDCA will soon begin to implement the ZAP1 Puppy Test as part of the WUSV Harmonisation program that member clubs have approved. Below is an extract from the SV (German) website regarding the introduction of the character assessment in Germany. The ZAP puppy Test is for animals 9-13 months of age. Breeding pedigree dogs is essential for meeting society’s needs for service dogs, working dogs, sporting dogs or simply a four-legged family companion. Pedigree dogs are branded goods that are characterised by their unmistakable “breed-specific” features. The character or nature is a feature set out in the German Shepherd standard, which is used to characterise the product as “typical” while taking many other factors into consideration. The assertions and requirements covered by the character judgment are principally designed to prove the dogs are environmentally sound and socially friendly. But they are also drawn upon as an additional examination for our working dog requirements. The character judgment includes determining a dog’s behavioural traits that manifest themselves on the basis of hereditary assets subject to the available breeding, development and posture qualities. At the 2017 Federal Convention, there will be an application for character judgments to be introduced. The core team behind the concept, consisting of Udo Wolters, Jens-Peter Flügge, Helmut König, Joachim Stiegler, Marco Ossmann, Heinz Gerdes, Egon Gutknecht, Egon Baumgart, Hartmut Setecki and Lothar Quoll, would like to take this opportunity to outline the most important points of the evaluation. Why do we need a character judgment? Society as a whole is being increasingly critical and applying significant pressure on dog breeders, handlers and pedigree dog breeding societies. Bans on dangerous dogs, and unscrupulous dog breeders and trainers are being more and more widely discussed. And the discussion always returns to devastating bite incidents involving dogs. The fear, which is largely the trigger and cause of these discussions and requirements that is at the heart of this issue must be taken seriously. Meaningful measures need to be taken to show that we are taking the situation seriously, and want to find solutions and foster a feeling of good will. Even-tempered dogs who have strong nerves yet are not excessively aggressive are in demand nowadays. The dogs must be able to adequately deal with the constantly changing demands of their social environment. By introducing the concept behind the character judgment, the society is implementing its wish to place our dogs’ nature and its fundamental importance at the forefront, and to make it possible to assess its influencing factors. And this is therefore important to later align canine efforts and work, to understand the reasons behind unwanted behaviour traits and disorders – also known as character deficiencies – and to help prevent these emerging further in the world of dog ownership in a way that is appropriate both for the animal and for society as a whole. We are responsible for using the knowledge arising from biological behavioural research on the nature of dogs available to us presently and for considering the knowledge gleaned from cynology. The key guiding principles are therefore using knowledge gained from biological behavioural research to better understand the dog, its behaviour and its behaviour development. In doing so, it is important to consider the interplay between inherited and acquired behaviour control traits, and between fear and aggression. There is no doubt today that a dog’s nature is not predominantly determined by genetics. Instead, it is the combined result of countless interactions between hereditary dispositions and natural, social and civilizing environmental conditions. Therefore, only the foundations of nature are inherited. Nature itself is not inherited, but rather it develops as a result of environmental conditions on the basis of genetic dispositions. Hereditary dispositions are not based on specific nature or behaviour genes, but rather on genes that when combined have an effect on the organism’s development and behaviour foundations. This means that one and the same gene influences the inheritance of physical and behavioural traits. Even if you discount necessary environmental influences as part of this consideration for ease – nature cannot be bred by itself. Our dogs have innate regulation mechanisms. They have an innate ability to learn. Using the different innate strategies for gaining experience, it is possible for the dog to complement its behaviour to the conditions within its “personal” environment. Learning is therefore not something distorting or overlapping, but rather fulfils the innate drive for openness and incompleteness. Learning – particularly formative and character-like learning – therefore allows a dog’s nature to develop. A dog’s nature is the result of a dynamic development process between genetics and environment. Unfavourable environmental deficiencies cannot be compensated for through breeding. Dogs who are unable to fulfil their innate drive for learning an open behaviour program naturally develop behaviour that is more or less distorted. In future, the society will not only support its members to teach a dog to perform to BH/IPO standards. By introducing the character judgments, we want to encourage dog owners to ensure that a dog is not deprived of anything that they need for their behaviour and nature to develop healthily (Kaspar Hauser effect). Furthermore, we must not expect anything unnatural from the dog, which may harm the development of their nature. Deprivation or excessive demands result in fear or aggressive behaviour. The way dogs live alongside humans has changed and our dogs must be introduced to these changing conditions. A puppy’s willingness for social convergence or confrontation with the environment crucially depends on their past experiences during rearing, and on the coping strategies they have learned and acquired until this point, as well as meeting their natural social needs. Without the right rearing and developmental conditions, our dogs cannot themselves show which genes they are really carrying, which is why humans must bear this responsibility to demonstrate what the dogs cannot achieve. What happens in a character judgement? As part of a character judgment, a dog’s behaviour and its flexibility is recorded by confronting them with different stimuli that may trigger or provoke a particular behaviour. A conclusion can be drawn on the dog’s nature based on their behaviour throughout the entire assessment, with the aim of checking the dog’s suitability for living with humans in today’s world as objectively as possible. Impartiality: The dog should allow their handler and an unknown person, e.g. the judge, to touch them at different points on the body. Noise sensitivity: In this section, the dog is subjected to different acoustic stimuli, e.g. rattling, engine noise and blanks being fired as the loudest stimulus. Certainty of movement: Sensitivity to heights (e.g. assessed by looking at a dog’s movement behaviour across tables) as well as a dog’s movement on flat ground. Play and predatory instinct/behaviour under stress: The assessment is based on how the dog plays with their owner (teamwork) and with an unknown person (representative). Furthermore, the intensity towards obstructed prey (willingness to find) and their willingness to play under increased demands (moving table) are also assessed. Only a dog that feels comfortable in its environment and can cope with the situation is able to play. Basic nature: Behaviour in isolation and when meeting an unknown person. The dog is assessed is two ways: based on the specific evaluation of each behaviour trait (descriptive) and based on reliability ratings. Not only are the dog’s reactions crucial here, but also how the dog manages the individual situations and using which coping strategies. If the dog becomes visibly overstressed, the assessment is stopped so that the dog is not harmed indefinitely. General grounds for exclusion include character deficiencies that are also stipulated in our breed standard. This affects dogs that are very anxious, aggressive dogs that show increased aggression in peaceful situations, as well as dogs that are sensitive to shots being fired. The description makes it easier for the dog owner and other persons involved to follow the results of the character judgment. By awarding reliability ratings, it is possible to add more weighting to more significant behavioural situations. Furthermore, the reliability ratings make it possible to gather statistics and monitor the character judgments more closely. What are the implementation provisions? Dogs aged between 9 and 13 months (inclusive) are permitted for entry. While the assessment is being taken voluntarily (until BV May 2017), dogs that do not fit in this time window can also be entered. For cases where a dog has not been entered for a character judgment at the right age with good reason, it is planned that they can subsequently be entered for a character judgment, regardless of age (re-entrant). This also applies to dogs bred abroad or dogs acquired when they are older who are then destined to be used for breeding in Germany. In both cases, a five-month waiting period automatically comes into force between passing the character judgment and the work element of the ZAP (similar to initially entering breeding programs aged between 13 and 18 months). Once the character judgment and ZAP have been passed, the dog must pass the breeding survey before they can be used for breeding without restriction. In the event of a negative result, the character judgment can be repeated once. It will be noted in the assessment documentation if a dog is repeating the assessment. A report will be drawn up for each assessed dog, which will then be given to the owner. The data sheet lists information about the age of the subject, gender, condition, husbandry conditions and future intended use. The character judgment is listed on the pedigree and the dog’s owner receives a certificate and completed assessment sheets. The assessments achieved are published in SV-DOxS. As with the breeding program, the society has made the “SV character judgment” program available to event organizers. How will the character judgment be supported? After the SV BV unanimously decided in May 2014 to introduce the SV’s character judgment, the core team worked on procedure and content of the character judgment. Since then, the VDH has required its pedigree dog breeding societies to carry out random behaviour tests. There are many parallels between the VDH procedure and our concept, whereby attention is also paid to the individual breeds’ coping strategies in assessment situations, as well as breed-specific characteristics as part of the assessment. In 2015, several pilot events were held in the SV and the experience gained during these events was then evaluated by the core team, implemented accordingly and the assessment sheets were modified as necessary. The pilot events were open to the public, meaning members had the opportunity to learn more about the assessment. At the same time, the core team also paid great attention to training judges as character judges so that there are now a total of 38 character judges (WBU) throughout Germany who have passed the training and are available to carry out the assessments. The core team determined that the character judgment is a main society event in the public eye – similar to a breeding survey. On the occasion of the SV BV in May 2016, the character judgment was first introduced on a voluntary basis. At the same time, the core team were tasked with developing the work element of the breeding examinations (ZAP). The concept was presented in several countries around the world and was very well received. 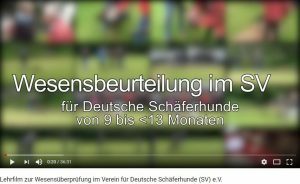 So much so, the WUSV decided to use the character judgment as a basis for harmonizing the global implementation of standardized breeding and training for German Shepherds in line with the SV’s applicable constitutions and regulations (Agenda 2025). What does ZAP stand for ?